Last year, 2017/2018 we developed togther with a freelancer a digital menu with ordersystem for Android. Now we are looking for to create a new design for our APP. We own an Ice cream & Hamburger parlour/restaurant. We offer our customers a great experience with gigantic ice cream sundaes, a variety of different hamburgers, made from scratch with our own beef. Part of this experience is our in-house ordering APK. We are using 10.1" tablets, so the design needs to be fitted to that specific size. Well, if we knew that we would not do a competation. But to guide you to what we want, the APK-design should give the customer a clean, exclusive feeling - but still simplicity. The APK-design must be easy to understand and not create question marks from our guests due to it's tricky design - but still amaze them. The menu is two designs (but should of course go hand in hand), first main page is for when a new guests arrives at the table, they will see a welcome screen and be able to choose "food, ice cream or drinks" from that view. There will also be a "Question mark" and a text below, "How does it work". This will be a popup screen briefly explaining for the guest how the APK works. 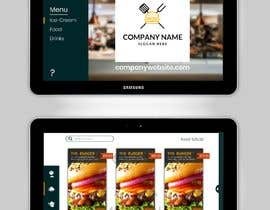 Second design is the actual menu, what it will look like when the customer browses through our menu. Keep in mind, this is a MENU, a regular menu, but on a tablet instead of a piece of paper in the hand. I've also attached a raw template made by me (I have NO skills in designing) just to give you a hint about what the two different designs has for needs. One is to greet and meet the guest, the second one is to help the guest browse our menu and choose their items. Any questions please post them and I will respond as quickly as possible. Hello. I am working on this. Please wait my design. Thank you. Are you after for a design only? or coded it as well? What do you mean about coded, you mean code the actual apk? Yes, code the actual apk, but I see that you are after a design, so working on it now. hey there! what's the name of the venue? do you have a logo? We don't have our new logo yet, that's why I want to the logo to be replacable.